In celebration of the two year anniversary of our http://reddit.com/r/cascadia subreddit, Viva Cascadia Flags is sponsoring a Cascadia sticker design competition to decide what the next great Cascadia sticker will be. Designs can be submitted through the official competition page here. Stickers should be less than 1 ft by 1ft in area, preferably a sticker that can be stuck on bikes and cars, signs, and doors. All over, really, and people are welcome to submit as many as they would like. The winner will be the top upvoted sticker. A base of at least 1000 stickers will be printed if there is 1 winner, 500 of each if there are two. Once created, stickers will be distributed to chapter heads and through the screenings of the Occupied Cascadia documentary to help get these out to everyone who would like one. These will be vinyl stickers. This competition is sponsored by Viva Cascadia Flags, who have been responsible for acquiring and selling all the Cascadia flags currently out there. As a reminder, these flags are available for order through their website http://cascadiaflag.com for $25 + SH. Good luck! We look forward to seeing what comes out on top. This contest ends on Nov. 7th. Don't forget to vote (on sticker designs that is!). A general update and reminder will be send out 24 hours before the contest ends, but don't wait! earlier submissions are likely to get more votes. Painting the Space Needle: Last week to submit your design! For many in the Pacific Northwest, it has been a dream to one day watch a Cascadia flag fly from the top of the Seattle Space Needle. Now, we can do better. Starting early Tuesday, August 21st, the Space Needle began accepting design submissions in a contest to decide the next paint job for the iconic Seattle landmark for the next six months, providing Cascadian artists with a prime opportunity to share their skills and get a Cascadia related design on the Space needle! Submissions are open to the public, and each person can submit up to 5 different designs. The free contest, which is open for submissions until September 20, can be found at the Space Needle's website, spaceneedle.com/topthis.html. 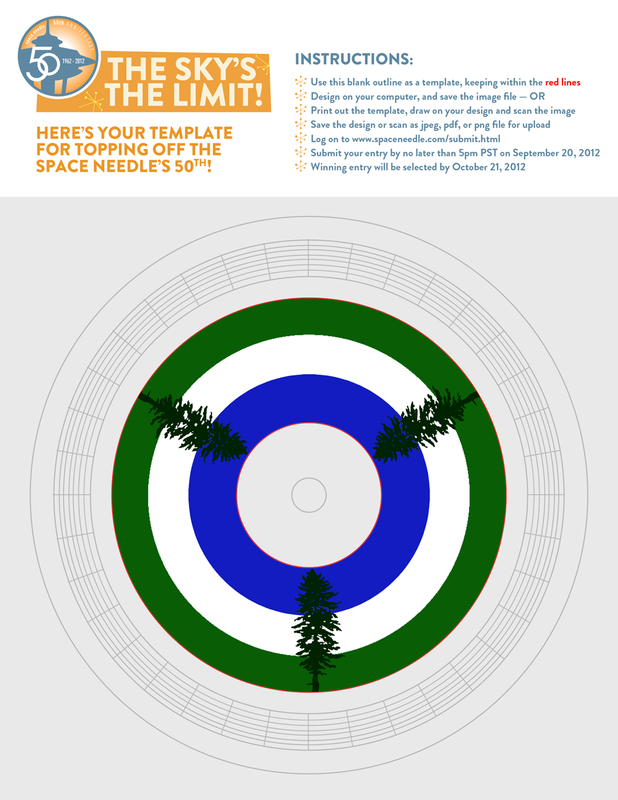 Aspiring contestants can download a blank vector image in the Needle top's distinctive doughnut shape, then fill it in with whatever design they choose – like, as in one already-submitted design, blue, white, and green stripes with three of the Cascadian flag's Douglas Fir trees spaced at equal intervals around the circle. The possibilities are endless! Those with graphic design interest may wish to depict iconic scenes of Cascadia – the flag flying atop a mountain, a soccer match or on a backdrop of the Pacific coast. Those (like the CascadiaNow artistic staff) whose talents are limited to drawing stick figures in Paint may find themselves taking a somewhat less grandiose approach – but all submissions are encouraged! More than one application is possible per contestant, so don't worry about finding that single perfect design – submit several! Applications will be narrowed to a field of five finalists by a group of local artists, then voted on by the public to determine the winning design. Expect an update in our October newsletter, especially if a Cascadia-related design (or several) make it into the final round! Anyone who makes a submission can trend on twitter with #topthis, make it visible with #Cascadia and make sure to let us know, either by emailing us at cascadianow@gmail.com or @cascadianow and we'll make sure to repost your design. Working through the Cascadia Subreddit, we have begun a three step voting process to help us choose a design for new Cascadia T-Shirts and Hoodies. Anybody interested can vote HERE. Registration for the site takes under 3 seconds, and then a new user can upload, submit their own ideas, as well as vote other designs that has already been proposed. The merchandise will be created by the Cascadian screen printing company Kotis Design, who created the first batch of T-Shirts and Hoodies. Aside from being available for purchase online, will be funded through a Kickstarter that we begin in early May, which will serve as a pre-order for stickers, bumperstickers, T-shirts and hoodies, and to try and drop the cost as low as possible. Upload your ideas as soon as possible! If you already have an image, you can either upload it to the photo hosting site Imgur for free, or go to Kotis Designs website where you can preview how it would look on a T-shirt or Hoodie. After that, just submit a link in the comments section on our post. Early in May we will begin a one month Kickstarter campaign to help us raise money to do a bulk order, which will drop the price as low as possible. Prices will sit at-cost (and whatever is reasonable for the printers of course), with any extra money going into creating more merchandise. Cascadia Swag will also be available for purchase anytime through an online store we will be setting up, or directly from their website, as well as patches, stickers, flags and any other merchandise people can think of.